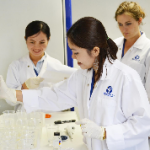 Why an Institut Pasteur in Lao PDR? Lao – French lab 2 / Medical Entomology & Biology of Disease Vectors. Because of global changes (environment, climate) and increasing transportation, in the past decades we have seen a dramatic resurgence of dengue and chikungunya throughout regions where Aedes mosquito vectors are present and this has led to major public health problems (WHO 2006, Benedict et al., 2007). In 2013, Lao PDR faced one its most severe dengue outbreak in years (Figure 1). The mosquito Aedes aegypti is the main dengue virus vector in Lao PDR (Dr Vongphayloth pers com.). Another species, Aedes albopictus, is a secondary vector of dengue, but is also the vector of the chikungunya virus that is reemerging in Southeast Asia and in Lao PDR. Because there is still no vaccine or specific treatment available against these viruses, vector control remains the only strategy for reducing dengue or chikungunya transmission. Effective vector control measures rely on active community participation, health education programs, and environmental management that include improvement of water supplies and storage, solid waste management, and modification of human-made larval habitats (Erlanger et al., 2008). During inter-epidemic periods or when the elimination of breeding habitats of the mosquito is not easily achievable, insecticide application in larval habitats is routinely conducted by public health services in many countries including Lao PDR (Thavara et al., 2004). Space spraying applications are conducted during epidemics or when the entomological indices of mosquitoes are high. For both l arviciding and adulticiding, organophosphates and pyrethroids are the insecticide families of choice worldwide, as well as in Lao PDR. Unfortunately, many dengue vector control programs are threatened by the development of insecticide resistance in Aedes populations across the world. Insecticide resistance is associated with mutations in the sequence of the target protein that induce insensitivity to the insecticide (target-site resistance, knock-down resistance mutation, kdr), and/or the up-regulation of detoxification enzymes (metabolic-based resistance, P450 monooxygenases (P450s), glutathione S-transferases (GSTs) and carboxy/cholinesterases (CCEs)). Strong levels of resistance to organophosphates and pyrethroids have been detected in Aedes aegypti population in Southeast Asia (Ranson, 2010). Resistance to these same families of insecticide has also been detected in Aedes albopictus populations worldwide (Kamgang et al 2010, Marcombe et al. 2014). The organophosphate temephos (larvicide) and insecticides from the pyrethroid family (permethrin, deltamethrin; adulticides) have been used in Lao PDR for decades to reduce the vector populations during important dengue epidemics but to date, compared to its neighboring countries there is no information available on the resistance status of Aedes populations and the possible impact of the resistance on vector control operations in the country. The risk of insecticide resistance in dengue vectors in South-East Asia represents a serious threat to the achievements seen in dengue control during recent years. It is urgent to identify the distribution, the levels, the mechanisms, and potential environmental factors of resistance in dengue vectors in the lower Mekong countries to assist health authorities to develop more effective strategies of prevention and control of the disease. Figure 1. 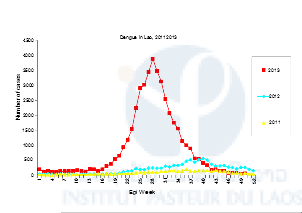 Dengue cases in Lao PDR, 2011 – 2013. 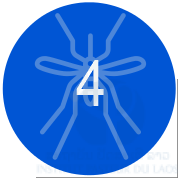 The purpose of this project is to provide entomology capacity building, identify circulating levels of insecticide resistance (IR), and improve data on vector risk profiles in high priority location in Lao PDR. + Evaluation of the levels of insecticide resistance in the vector populations in Lao PDR. + Evaluation of the types and mechanisms of insecticide resistance (i.e. metabolic or target site) in Laos. + Capacity building in medical entomology in Lao PDR. + Guide public health authorities of Laos in the design and implementation of Insecticide Resistant Management strategies. + Capacity strengthening in medical entomology and vector control in Lao PDR. It was decided to focus specifically on 3 provinces for the study of insecticide resistance in dengue vectors (Vientiane, Luang Prabang and Attapue). For each province, larval collection were implemented in rural and urban areas. Contact was made with several provinces to obtain larvae from the field. 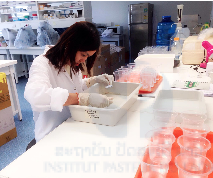 In July 2014, collections were made in Xanyabouly and Luang Prabang provinces (Figure 3) and larvae collected by collaborators from Savanakhet (CMPE and district staff) were sent to the Institut Pasteur du Laos. In Xanyabouly province, Borten district, larvae were collected in breeding habitats in several villages and brought back to the laboratory for rearing. Larvae were collected in the forest surrounding Tinkheo village and in rubber plantations (rural areas) in Luang Prabang province. Larvae were also collected in Luang Prabang city in households and in Temples (urban area). For all the mosquito populations collected, larvae were reared until adults (F1 generation). After adults identification, mosquitoes obtained were separated by species and locations. Only Aedes aegypti and Ae. albopictus were kept for breeding. Female mosquitoes were then blood fed and eggs obtained were kept for the future larval and adult bioassays. Approximately 5,000 of Aedes aegypti larvae and 3,000 of Aedes albopictus larvae were collected from all study sites. We started to test the susceptibility of Ae. aegypti mosquitoes to a range of insecticides representative of those historically and currently used for mosquito control in Lao PDR (i.e. DDT, temephos, deltamethrin and permethrin). Larval and adult bioassays were performed following WHO guidelines (WHO 2005, 2006) on mosquito populations from Vientiane capital (Figure 4). 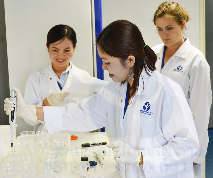 The trial started in October 2014 in Vientiane at the Pasteur Institute of Laos. According to WHO procedures (WHO 2005), the effects of temephos, Bti, diflubenzuron and spinosad formulations will be evaluated and compared. Plastic containers with a high capacity (200L) were used because they are widely found for water storage in Lao PDR. These containers were filled with domestic water and covered with a mosquito net to prevent oviposition by wild female mosquitoes in the area and to prevent the deposition of debris. Containers were placed under a shelter to prevent direct exposure to rain and sunlight (Figure 5). The formulations are tested at the WHO-recommended dosage for the control of mosquito arvae (WHO 2006). A total of 15 containers (3 replicates of each insecticide and 3 controls) are used. 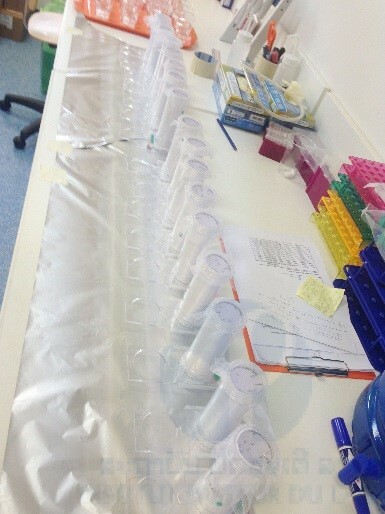 Groups of 100 third-instar larvae of the F1 generation of the Pasteur strain (IPL strain) were added to each container with one l gram of food (dry cat food) at time 0, and then every 10 days until the efficacy, i.e., the emergence inhibition rates of the mosquitoes (EIs) decrease to < 80%. Figure 5. Semi field trial at the Pasteur Institute of Laos. Efficacy of conventional versus alternative insecticide formulations used for vector control are tested. Benedict MQ, Levine RS, Hawley WA, Lounibos LP (2007) Spread of the tiger: global risk of invasion by the mosquito Aedes albopictus. Vector Borne Zoonotic Dis 7: 76-85. Marcombe S, Farajollahi A, Healy SP, Clark GG, Fonseca DM (2014) Insecticide Resistance Status of United States Populations of Aedes albopictus and Mechanisms Involved. PLoS ONE 9(7): e101992. Ranson, H, Burhani, J, Lumjuan, N and Black, WC (2010) Insecticide resistance in dengue vectors. TropIKA.net Journal; 1(1). Thavara U, Tawatsin A, Kong-Ngamsuk W, Mulla MS, 2004. Efficacy and longevity of a new formulation of temephos larvicide tested in village-scale trials against larval Aedes aegypti in water-storage containers. J Am Mosq Control Assoc 20: 176 – 182.
WHO, 2005. Guidelines for Laboratory and Field Testing of Mosquito Larvicides. Document WHO/CDS/WHOPES/GCDPP/13. Geneva: World Health Organization. WHO, 2006. Pesticides and their Application for the Control of Vectors and Pests of Public Health Importance. Sixth edition. WHO/CDS /NTD/WHOPES /GCDPP/ 2006.1. Geneva: World Health Organization. Follow our south-south scientific cooperation with Institut Pasteur de Côte d’Ivoire with the support of the Michelin Corporate Foundation ! P.O Box 3560, Vientiane, Lao PDR.